Canon has just announced their successor to their line of Advanced Full Frame EOS DSLRs in the form of the new 5D Mark III. The new camera has been a long time coming since the its predecessor the 5D Mark II was released back in 2008 – four years ago. The new EOS 5D Mark III features an upgraded 22.3 Megapixel sensor, 61-point autofocus, 6FPS burst shooting, 1080p video recording with manual exposure options, and native ISO up to 25,600. You also get a larger 3.2” 1,040,000 dot LCD, enhanced weather sealing, dedicated Creative Photo button (which includes HDR shooting), and other enhancements. Even though the full frame Mark II is still quite a remarkable camera today, some users have complained about its autofocus accuracy. Hopefully the new Mark III addresses that and then some. That applies at least for full frame shooters in the Canon camp, as there’s not much reason not to get the Mark III unless you already have the Mark II – since the specs didn’t leap too hugely from the predecessor. Whichever the case, you can check out the specs and price below. 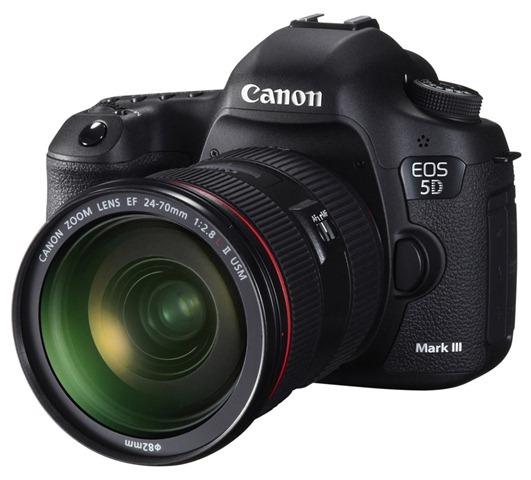 The EOS 5D Mark III hasn’t been announced in the Philippines yet, but will be released in the international market soon from the end of March 2012 for US $3499 (PHP 150,000) Body Only or $4299 (PHP 185,000) with a 24-105mm lens.